Okay, sure, the Origami Chair from Form Us With Love is inspired by, that's right, origami. But plenty of things have been inspired by origami and not really turned out to be all that inspirational. 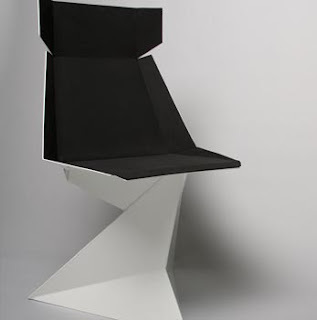 This isn't one of those cases though, because the Origami does an outstanding job not only looking a bit like origami, but also looking like an amazingly beautiful chair. The premise: "An idea to work conciously with light and shadows resulted in a sculpturally beautiful chair with architechtonic appearance." It's made from lacquered aluminum and diver suit padding.